Transportation minister participates in trial run of Tel Aviv-Jerusalem high speed train, set to open at the end of March. 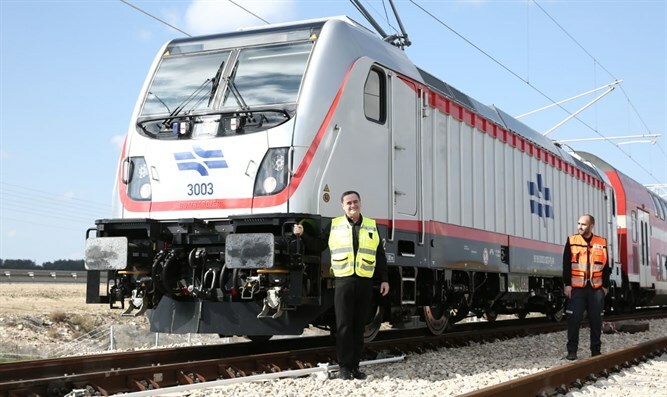 Israel's Minister of Transport and Intelligence, Yisrael Katz (Likud), participated in a a test run of the new Jerusalem-Tel Aviv train line on Tuesday, within the framework of tests conducted by Israel Railways along the route of the high-speed line ahead of its expected inauguration, in about three months on the eve of Passover. During the trip, which was attended by a large number of journalists, Minister Katz revealed that he had decided to call the line linking Tel Aviv to Jerusalem, the King David line. "We are connecting Jerusalem and connecting to the history of Jerusalem. I decided to call the fast rail line to Jerusalem King David Railways after King David, who conquered Jerusalem and turned it into the capital of Israel,” an event which occurred over 3000 years ago. The Minister of Transportation noted that the fast railway line to Jerusalem, which will open on March 30, 2018, will enable the Israeli public to make a pilgrimage to Jerusalem via an electric train that will travel through dozens of kilometers of tunnels and bridges at a speed of 160 kilometers (99 miles) per hour. The train will pass Ben Gurion Airport, Modi'in and Sha'ar Hagai, and will arrive in Jerusalem from Tel Aviv in just 28 minutes. The bus ride is of approximately an hour's duration, and more when there are traffic jams. Minister Katz announced that during the first three months of the train's running, it will be possible to travel the Jerusalem-Tel Aviv route back and forth free of charge via a "Rav Kav" card. At the end of the three months' free travel, a 50% discount will be given to passengers for several additional months. The Jerusalem express train line includes a double track of 56 kilometers (35 miles). The project included the mining of 5 tunnels, with a total length of 38 kilometers (24 miles) and 8 bridges, with a total length of 7.5 kilometers. The line passes through a tunnel 11.5 kilometers (4.7 miles) long, considered the longest in the country, and over a bridge about 100 meters (328 feet) high, considered the highest bridge in Israel. In the first stage, the train will operate one line from Ha’uma station in Jerusalem to the Haganah station in Tel Aviv. During the first few months of operation, the train will operate two trains an hour, in each direction. In the second stage, which will begin a few months later, the train will operate two tracks between Ha’uma station and the Haganah station, and the frequency of the train will increase to three trains an hour. In the future, the train frequency will increase to six trains per hour during peak hours. Ha’uma station is located about 80 meters below ground level. Passengers will ascend to the upper level of the station, using three fast elevators, each accommodating 35 passengers, allowing the passengers to climb to the upper platforms within a few seconds. It is also possible to climb to the platforms using a fast escalator system. As part of the preparations for the operation of Ha’uma station, Israel Railways began training the future station staff, which will include dozens of employees and functionaries. In the last few days, the course for shift managers at the Israel Railways Training Center ended, which included operating command and control centers deep in the ground, managing the station in routine and emergency situations, and rescuing passengers in unusual situations. Minister Katz noted that the express line to Jerusalem is the largest project currently under development by the Ministry of Transportation. According to him, the line connecting the coastal plain with Jerusalem will allow thousands of workers who travel daily to and from Jerusalem to reach the capital quickly and comfortably. "I urged Israel Railways to shorten the timetable for completing the project, while maintaining maximum safety," Katz added.